A food processor is a versatile kitchen appliance used to prepare ingredients by quickly chopping, kneading, shredding, slicing, or blending. 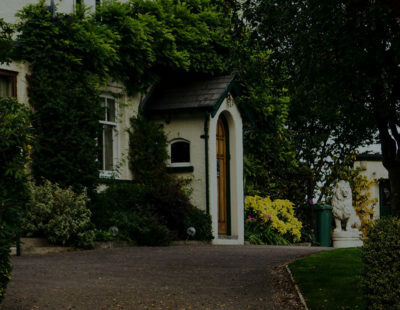 An essential kitchen appliance for all cooks, a food processor is similar to a blender, except it doesn’t require liquids to effectively blend. 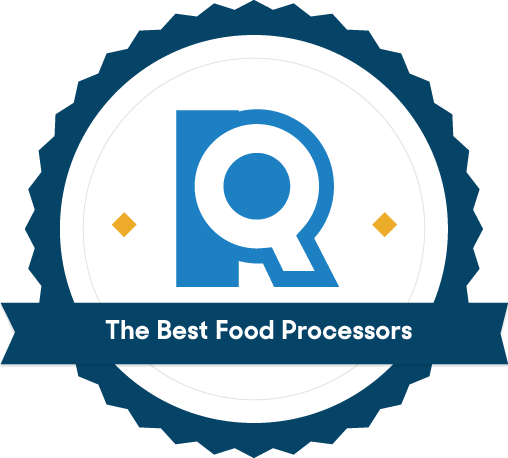 We consulted experts and gathered top-rated food processors, then put them through tests to determine their strength, efficiency, and user-friendliness. In the end, we found three machines we could rely on, whether cooking for one or for the whole family. As we set out to find the best food processor, we turned to Norene Gilletz, author of The New Food Processor Bible, for advice. Gilletz has been cooking with and writing about food processors for almost 40 years — about as long as they’ve been on the market. She recommended starting with an 11- or 12-cup food processor to ensure that you have enough capacity for the food you’re making. 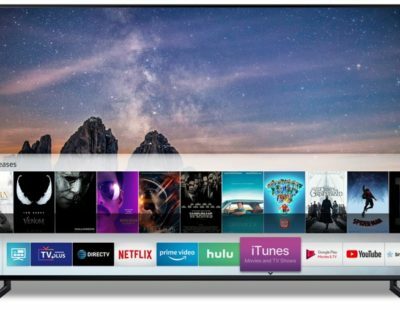 From there, we collected user reviews from Amazon and Bed Bath and Beyond and compared highly rated food processors from other review websites. This gave us seven of the most commonly praised food processors. These food processors come from respected brands and largely range from 11 cups to 14 cups, large enough to handle cooking for a family without taking up too much real estate on our countertop. 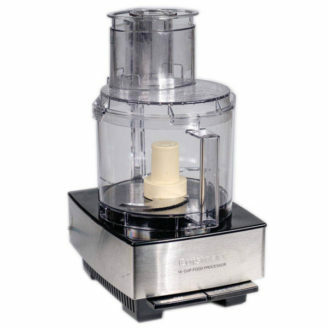 And while that fell in the range Gilletz suggested, we also decided to include the 9-cup Ninja Food Processor because of its popularity and high ratings. We ordered in our seven food processors and put them to work chopping and kneading. We set up our first test to find out if our food processor motors were strong enough to handle the bulky weight of kneading pizza dough. If any of the food processors slowed down under the pressure or stopped entirely, we started to question whether they could handle other dense foods. On the other hand, food processors that could work this extra-dense dough without a struggle could be trusted to handle tough ingredients. Our best food processors pulsed the mixture of flour, salt, and yeast mixture into a ball in less than a minute and spent the rest of the prep time whirling the dough ball around the pitcher. The Cuisinart outshone the competition by repeatedly dropping the dough into the blades, resulting in a nice, even mixture. Most food processors simply chopped off the bottom of the dough ball and spun those pieces back up to be mixed in again. Next, we tested how well the sharp blades of each food processor handled common foods. Would it chop evenly, or would we have large carrot chunks mixed with mashed onions? Would we have to pull out our spatulas a dozen times to scrape the bowl as food climbed the sides, or did the bowl design make it fall back in naturally? To find this out, we took garlic cloves, onion, bell pepper, and a large broken-up carrot to each bowl, then pulsed the blades to achieve a finely minced texture. We also used this test to look into how easy it was to add ingredients into the bowl. A larger chute meant we could drop in entire onion halves, where a smaller chute meant additional prep work just to use our prep-work machine. Food processors are known for doing prep work quickly without complaint, but they’re not exactly known for being easy to clean. If you have a dishwasher, feel free to run any of our tested picks through without worry; they’re all dishwasher safe. We found that ridges on the inside of a pitcher made it hard to scrape clean, making us get a little more creative with our spatulas to avoid leaving food behind. Getting in between blades is also more difficult than it looks, so we gave props to the food processors that eliminated most of that hassle (and hazard). This food processor impressed us with its excellent results and user-friendliness, making it a great choice for expert chefs and beginners alike. The best food processors can give us high-quality results — finely minced vegetables, and ready-to-go pizza dough — in seconds. And while the BLACK+DECKER, Oster, and Hamilton Beach models were all speedy, only the Cuisinart and the Breville prepared our food at chef-level quality, neatly chopping through a pound of vegetables in 10 seconds. The Cuisinart particularly excelled because it came closest to actually kneading the pizza dough instead of dragging it around the top of the bowl. In our chop test, after a quick pause to scrape the inside of the pitcher, the Cuisinart gave us even, fine, textured vegetables with only a few fast taps of the “pulse” button. This efficiency meant we were ready to move on with our recipe in seconds — unlike the KitchenAid, which still needed more chopping time after we leaned on the pulse button for 30 seconds. 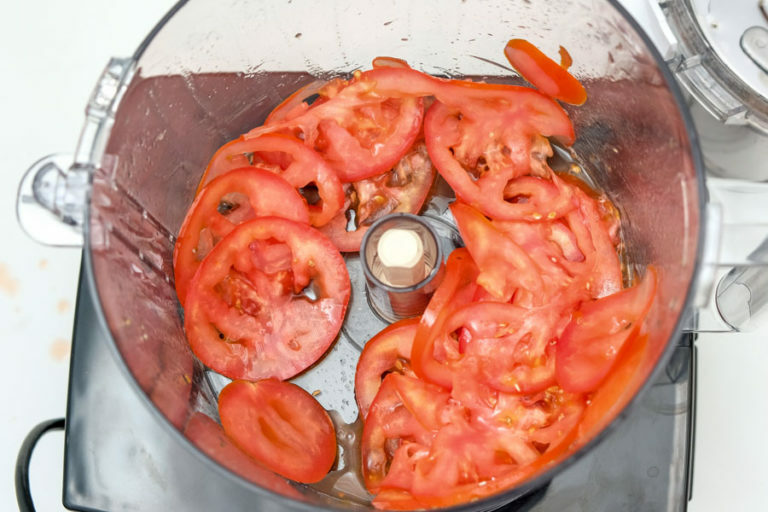 And when we put our top picks through one last test to see how well they sliced ripe tomato and shredded mozzarella, the Cuisinart demonstrated that its attachments weren’t just for show. We received thin slices of tomato and a very fine shredding of cheese within seconds. At first, we liked the BLACK+DECKER’s and KitchenAid’s extra storage boxes for their discs and blades, but they take up almost as much space as the machine itself. We ended up preferring how compact the Cuisinart is: All of its attachments fit inside the bowl easily, so its accessories don’t clutter up our countertop or get lost in the depths of a cupboard. All of the Cuisinart’s accessories can fit inside the bowl for storage (left), while the Breville (center) can’t comfortably fit both its blade attachments. The Hamilton Beach model, right, can also store its extra parts within its bowl. If you don’t have a dishwasher, the Cuisinart’s bowl and lid are smooth, making cleanup as easy as scraping off the food — there are no hiding spots for scraps and bacteria. The only drawback to the Cuisinart is that it can be a little tricky to assemble. If you put food in the pitcher before it’s on the base, sometimes the blade won’t set properly, and you’ll need to rotate it into position. The lid also locks the pitcher onto the base, and you won’t be able to remove the pitcher unless you take off the lid first. The Breville’s design upgrades it from a simple machine to a versatile cooking aid. Where the Breville really stands above the competition is in design quality. The Breville simply felt nicer to use than the other food processors we tested. 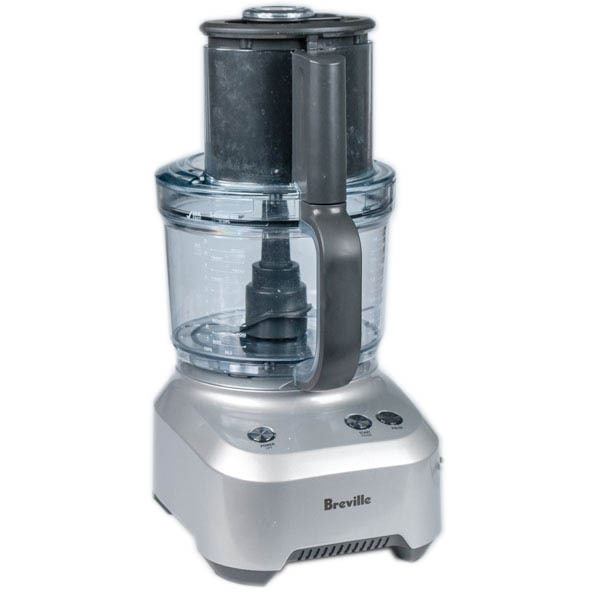 All food processors have plastic bowls, but the Breville’s is made of sturdier plastic, and its handle is comfortable to hold and carry around. Both the pitcher and feeding tube allow you to measure volume in cups, ounces, and milliliters right inside the processor — no preliminary measuring required. The Breville also has assembly guidelines to help you lock everything in with a satisfying click instead of fumbling to line up parts just right. If you’re planning on running soup through your food processor, the Breville has the largest liquid capacity of our top picks, so you won’t need to split your recipe into tiny batches. It holds up to 4 cups of thin liquid without spilling, and the Breville’s bowl is liquid-tight. We didn’t have to worry about unintended leaks, unlike the Cuisinart, whose hollow stem (which fits the blade onto the motor) limits it to 3 cups of thin liquid. The results of our accessories test were a little more mixed: The Breville successfully shredded mozzarella, though not as finely as the Cuisinart, and some of the soft cheese got stuck in the lid. And though we eventually got some nice slices of tomato from the Breville’s slicer, the first two pieces came out crushed. The Breville is meant to be a countertop staple, and with its heavy weight, you wouldn’t want to move it around often. It’s our heaviest pick, coming in at 16.75 lbs — just above the Cuisinart’s 14.5 lbs, and easily outweighing the 6.5-lb. Hamilton Beach. This sturdiness helped the Breville stand steady as it worked through dense dough and tough carrots, but it makes lifting it more of an arm workout. Our budget food processor does all of the work of machines four times its price, with good results for a beginning chef. While the Hamilton Beach can’t quite compete with the Breville and the Cuisinart, we were impressed by how well it did compared to many of our other test processors. It performed admirably in the pizza dough and chopping tests, with only a brief second of struggle as it powered through the dense dough ball. During the chop test, we found all three settings — Slice/Shred, Puree/Mix, and Pulse to Chop — were fairly aggressive. A short tap was enough to send the blades spinning in a way that felt much faster than the Cuisinart or the Breville. The result was a slightly louder and shriller food processor, but it made short work of turning our vegetables into a fine mince. Hamilton Beach also resolves one of the most common frustrations of owning a food processor: the frequent battle to lock in each piece perfectly. As advertised, the bowl stacks and the lid snaps into place without the fumbling assembly that seems to be a rite of passage for beginner users. 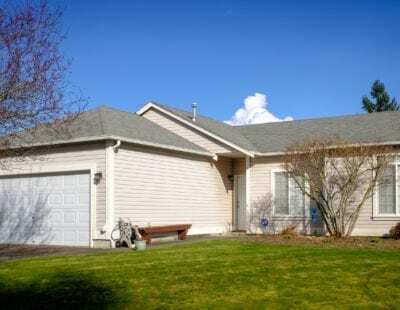 However, Hamilton’s cheaper price shows up in the quality of its results. We had to cut the chopping test short to prevent the nicely minced onion from becoming mashed onion, but somehow we were still left with large slices of garlic. And of our three top picks, we weren’t impressed by the Hamilton Beach’s dual-sided shredding and slicing disc, with some of the results making us wish we’d done it by hand instead. When we used the Hamilton Beach attachments, our tomato came out mostly smashed, and nearly half of our mozzarella ball failed to make it through the shredder, getting stuck between the disc and the lid. All of our top picks are dishwasher-safe, but if you need to hand-wash or quickly wipe clean between different types of food, Hamilton Beach takes a little more work. It hosts a few ridges that trap food, making it the hardest of our picks to clean. Gilletz told us that getting a thinner or thicker slice, or a finer or coarser shred, is less about the blade and more about how much pressure you use on the feeding tube. Rather than purchasing more accessories, practice applying different levels of pressure as you input the food. If you’re using your food processor to tackle a cheese-related recipe, try freezing the cheese first. Sticking soft cheeses (like mozzarella) in the freezer for 15 minutes or so to firm up makes them easier to shred. Our expert only called out two foods that she would not recommend trying out in your food processor: starches and egg whites. Mashed potatoes will still have to be done by hand, as they turn gluey under the blade, and while there are egg-whisk attachments you can buy for your food processor, Gilletz recommends sticking to your hand mixer to get a better result. Gilletz told us the secret to a faster cleanup: Once the food processor is scraped clean, put water and a drop of soap into the bowl, then press “On.” You can also run most food processors through the dishwasher, but you’ll want to avoid leaving on stickier food (like pizza dough). Is there a difference between a blender and a food processor? Yes. 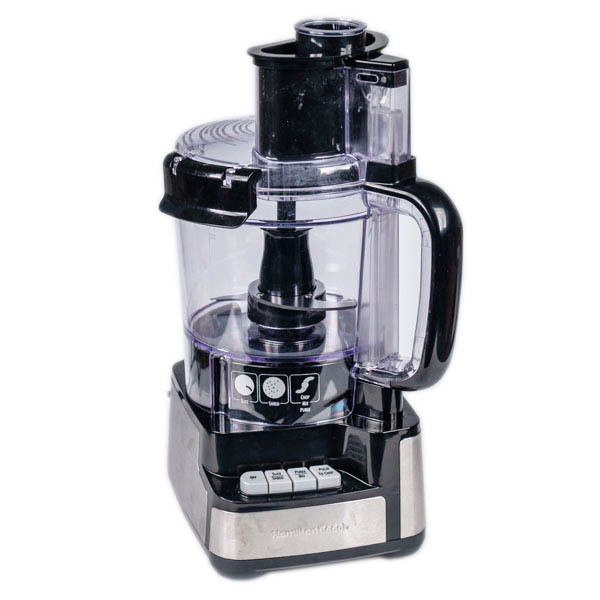 The difference between a food processor and a blender is marginal, although each machine specializes in different tasks. 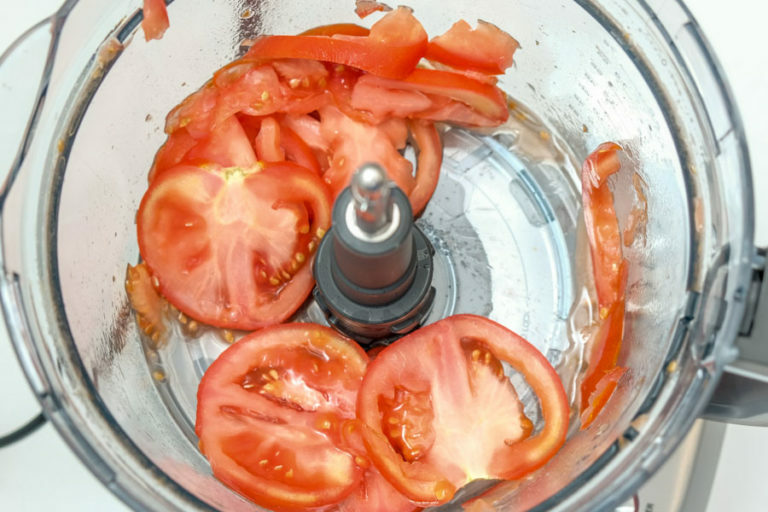 A blender is best for liquids, like smoothies, soups, sauces, and purees, whereas a food processor is more versatile, chopping vegetables, creating blended dips, grinding nut butters, shredding and mixing cheeses, and kneading dough for baking. Can I put ice in a food processor? To preserve the life of your food processor, it’s best to avoid crushing ice in it. While adding some ice along with other ingredients is probably fine, much like adding ice to a smoothie in a blender, filling your food processor’s bowl with just ice will likely damage the blades. Do you need a dough blade for a food processor? Our expert told us that dough blades were unnecessary, and when we went back and tested the Breville’s dough blade, we came to the same conclusion. The duller blade took a minute longer to bring the dough together into a ball, and it still only chopped the dough instead of kneading it. You can use the standard blades to get the same job done.